i’ll be honest… i’m not super-familiar with yarraville. apart from a handful of visits for dinner + it being my closest officeworks to home (ocd stationary-addict alert!) 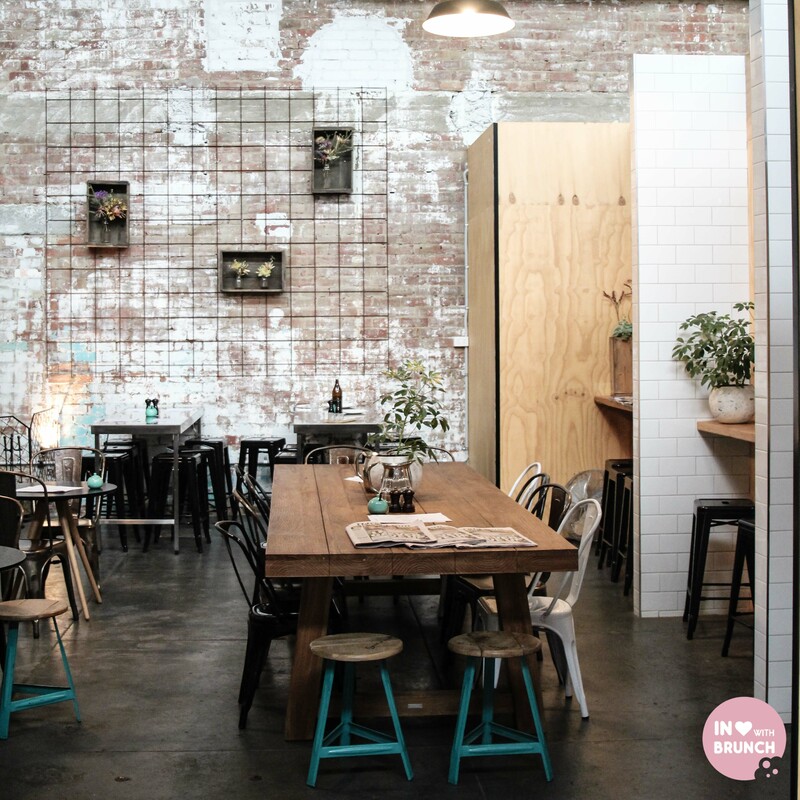 – i’ve really not ventured much into this part of the west as usually footscray gets my foodie attention. 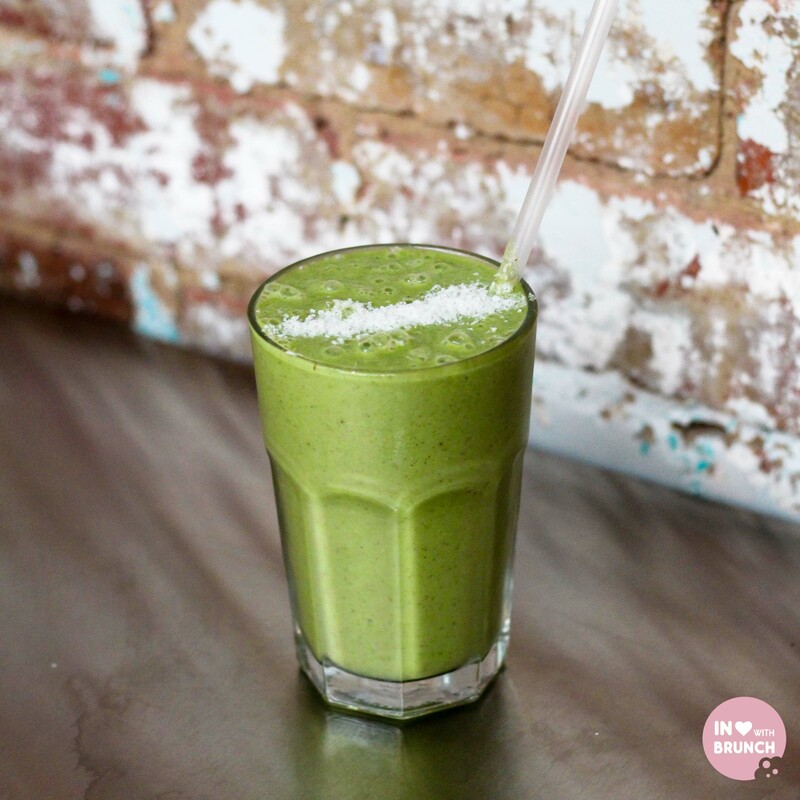 now, for those health-consciously inclined – giddyup mule is going to be right up your alley! located in the front section of ‘art of cycling’ – an innovative indoor cycling training studio – the menu caters for those needing a protein pick-me up or a super-food feed. thankfully, on a cold rainy melbourne day like the day that i visited, the café also caters for those needing a hot cup of coffee, some comfort food, and some down-time by the corner fireplace. this dish had been tempting me for far too long, and thankfully my (high) expectations were exceeded. i could imagine myself indulging in this crumbly and soft banana + blueberry bread straight out of the oven with nothing but butter. 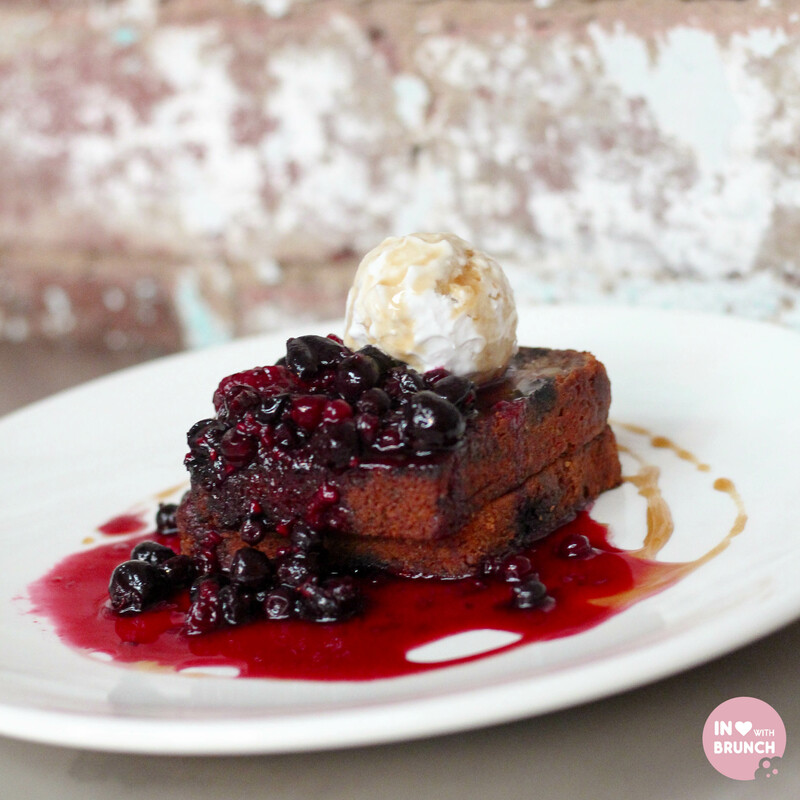 however the addition of the rich berry compote + coconut ice cream allowed this dish to stand as a meal on its own – indulgent, but still healthy enough that i didn’t feel (too) guilty. only small point was that our coconut ice-cream was just that little bit too frozen and we needed to wait a few minutes to let it defrost in order to add the right creamy element to a mouthful. i’m a huge fan of a pulled pork benedict + this one had just the right amount of smoky/spicy bbq sauce for my liking. 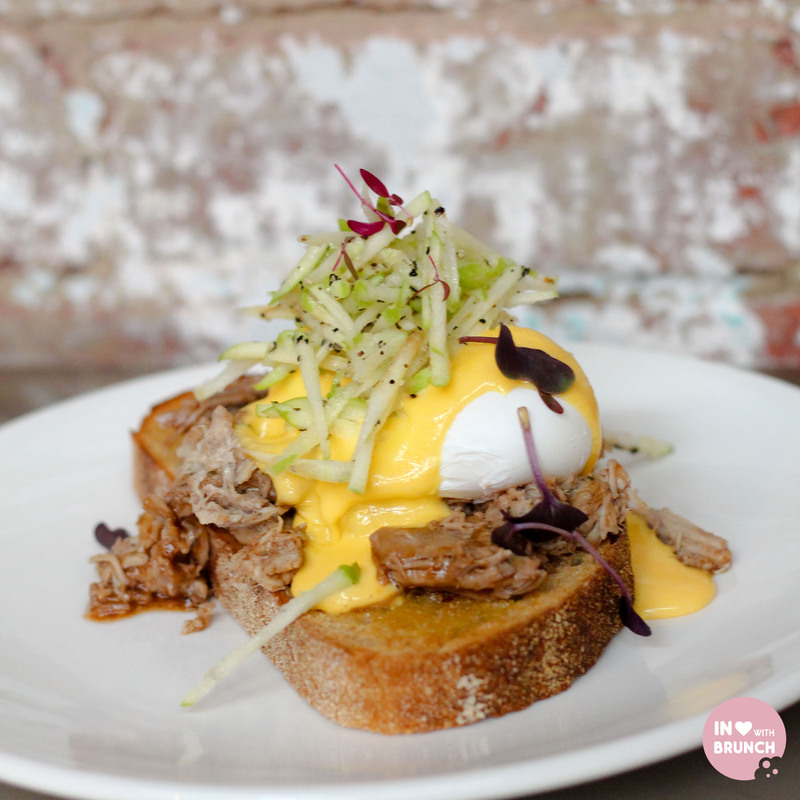 piled high with crispy fresh apples + a generous dose of hollandaise, this flavour combination was spot on. and i always breathe a sigh of relief when those poachies run golden yellow with yolky goodness. 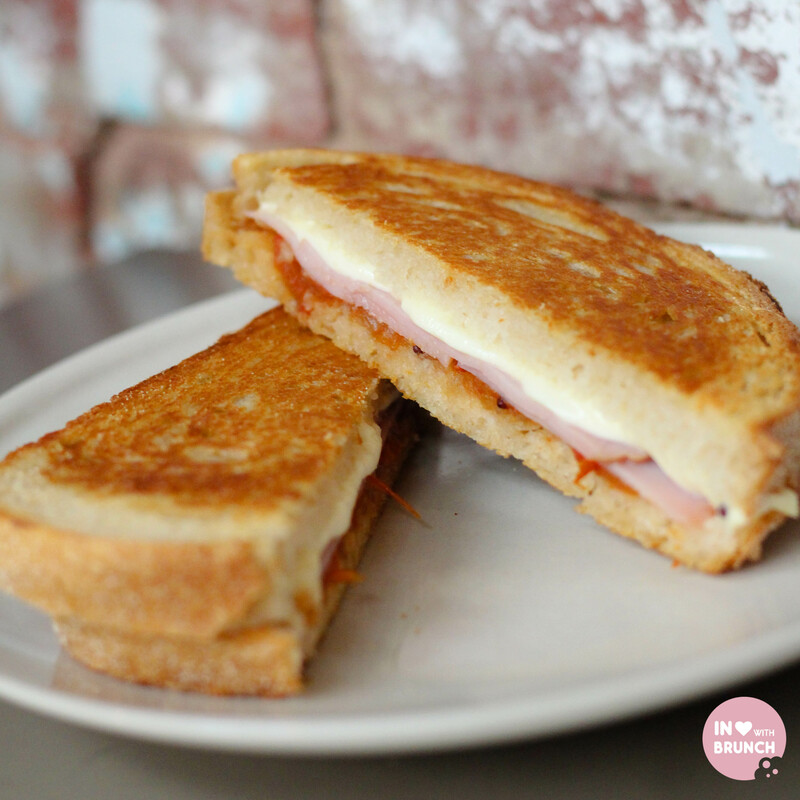 this is on the weekday (mon-fri) menu – and a really clever idea for a light + easy classic. 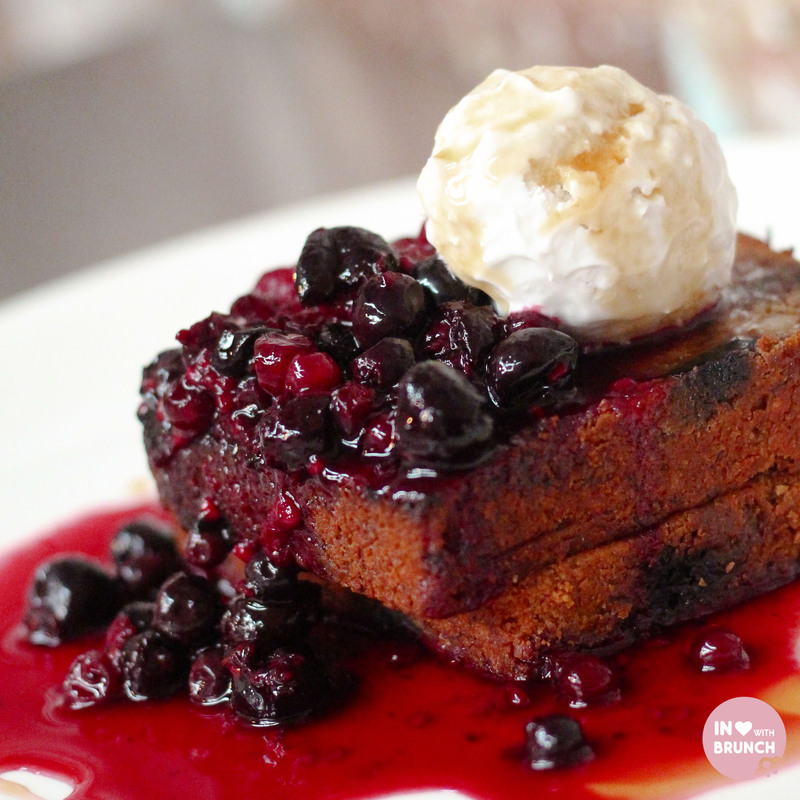 much enjoyed by my husband, before he dived into demolishing the banana + blueberry bread. 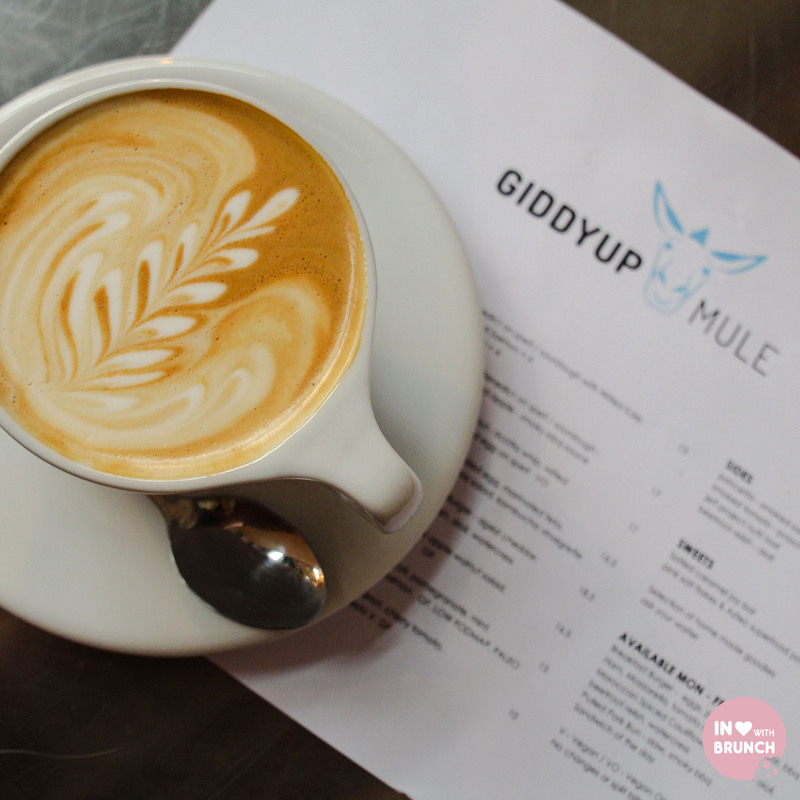 on the coffee front… giddyup mule are the only westy-café serving up well-known axil coffee roasters. 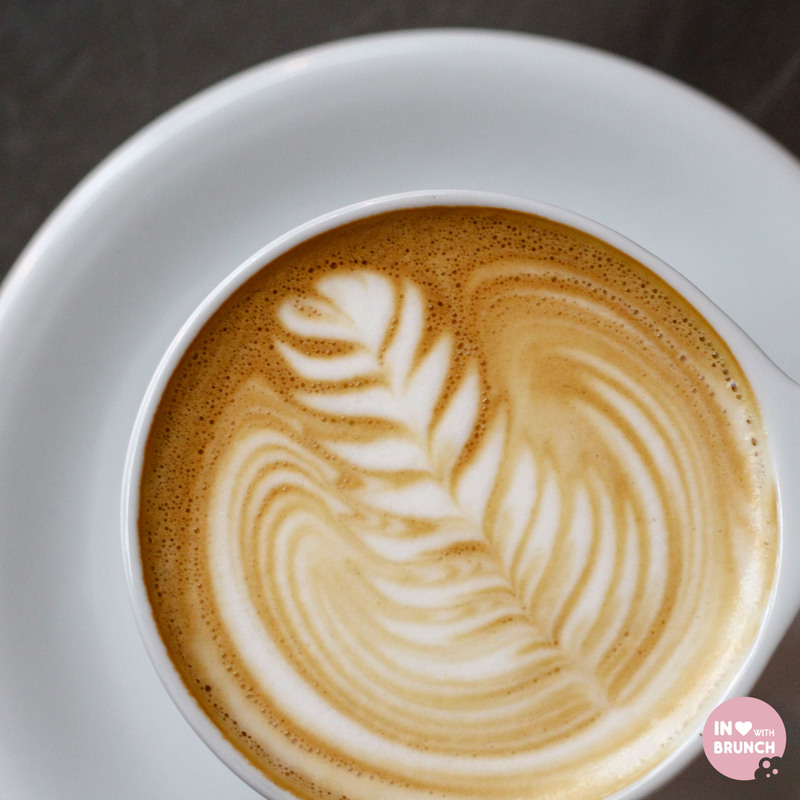 my flat white definitely hit the spot on this rainy cold morning. for a not particularly health-conscious musician (his favourite food is pizza! ), my husband has been trying his share of green smoothies lately and this one got his tick of approval. the vegetable taste wasn’t too overpowering and the mint, kiwi + pineapple lent just enough sweetness to give this an overall fruity + tropical taste. not bad when it’s also good for you! 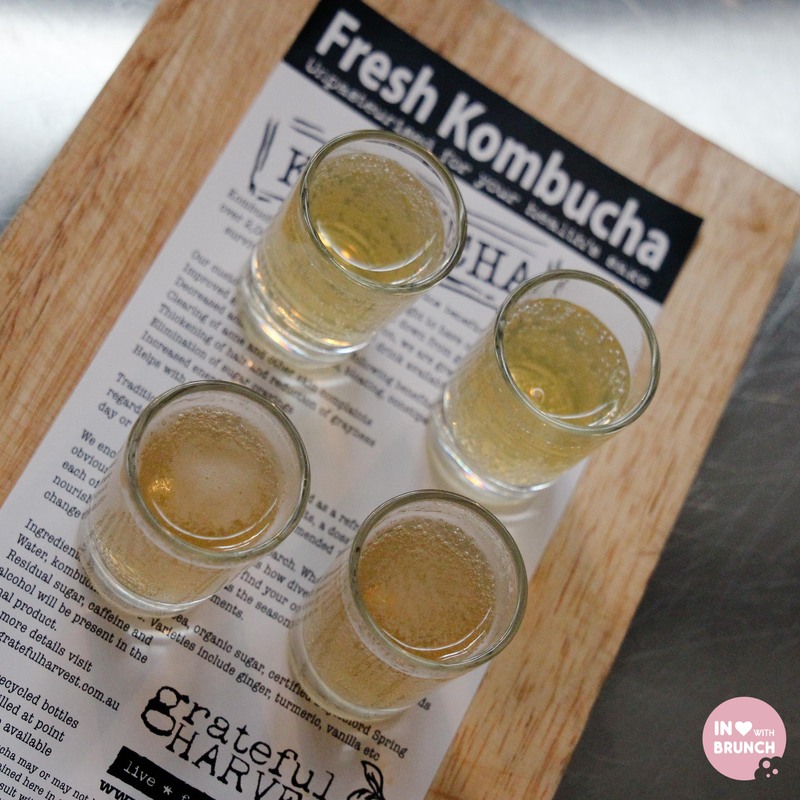 we were also lucky enough to be given a few samples of the grateful harvest kombucha that giddyup mule have on-tap in the café… a spiced orange and also a ginger + turmeric variety. 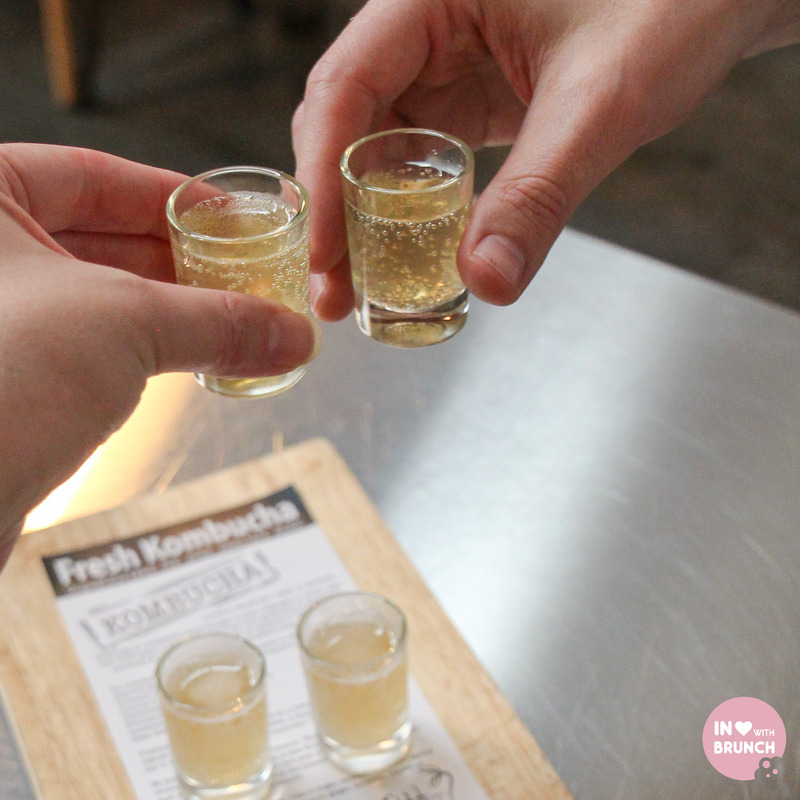 a good gut-health shot after indulging in a couple of dishes; but i could see the cyclists loving this pre or post-class as a refreshing kick-starter too. 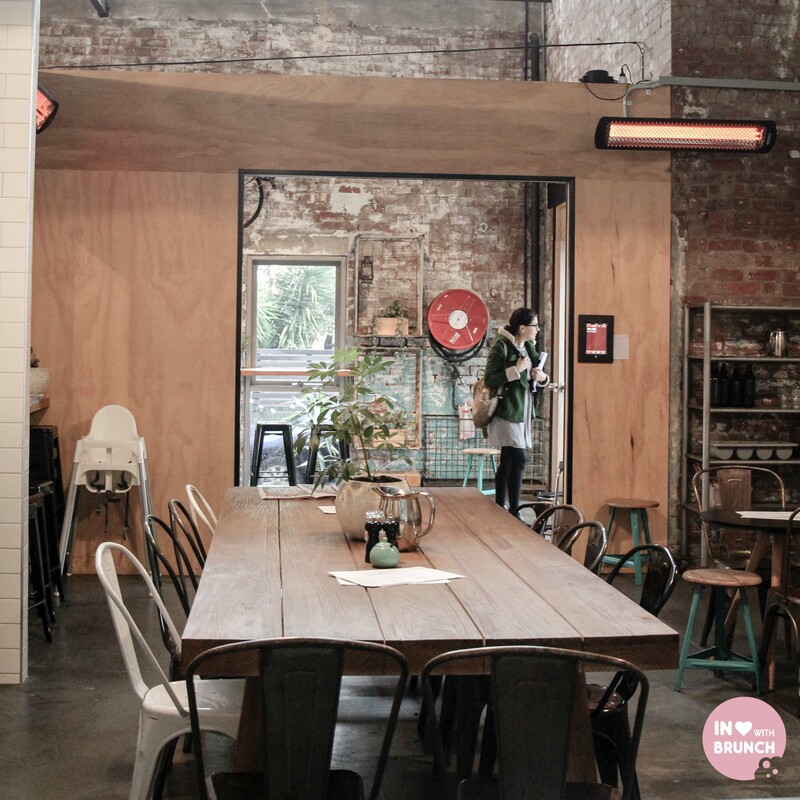 the interior of the café is gorgeous… a huge converted warehouse with exposed brick, tall exposed ceilings + concrete floors. just quietly, it’s the kind of space i dream of owning + renovating as a home one day… and one that i was totally not expecting on an unsuspecting yarraville street. given the weather it was a pretty quiet morning, but the service was friendly and attentive without going overboard. if you’re west-side based and haven’t checked this place out yet, i definitely recommend it. 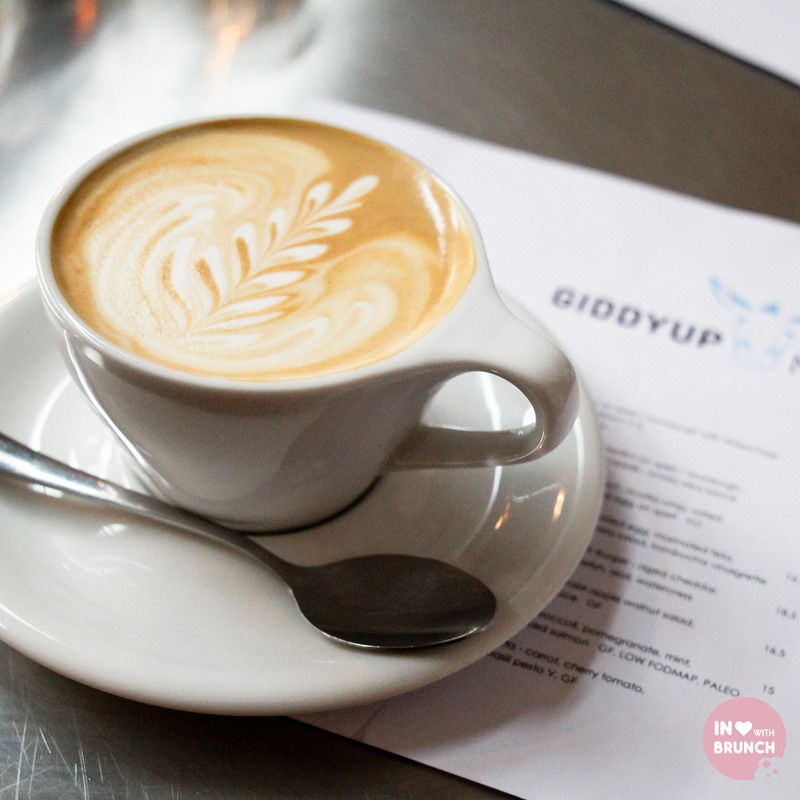 and even if you’re not and you fancy a cycle-class followed by delicious food; or a good bike ride out to yarraville or even a weekend adventure, then i’d recommend putting giddyup up the top of your list. 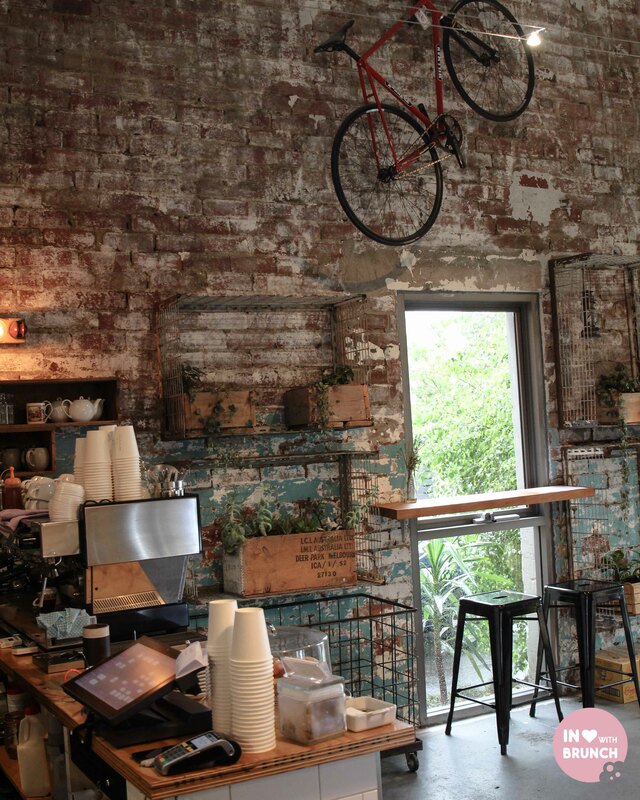 verdict: get on ya bike and get down to yarraville!